Now this is embarrassing. 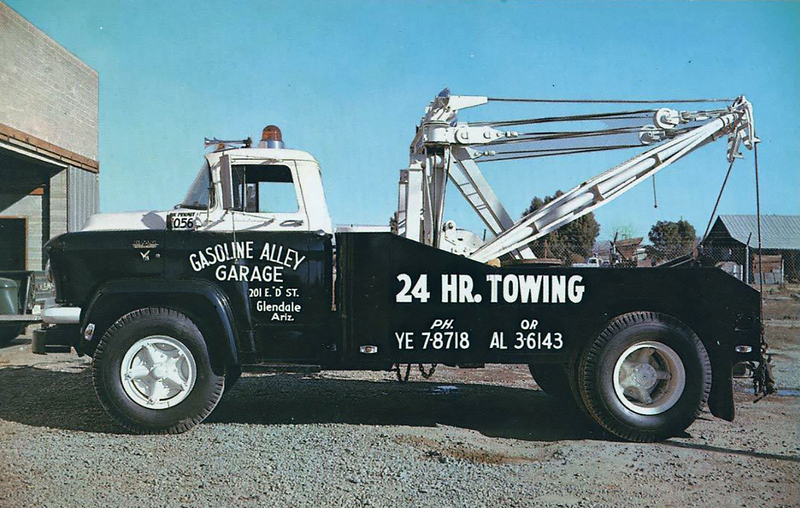 Looks like the old jalopy broke down again, and here we are, miles from anywhere, somewhere near 1950s Glendale, Arizona. I don't see any signs, so we might be half-way to Peoria by now. I'll take a look under the hood. Just what I suspected, it's broke. No, I'm not blaming you, but you worked on it the last time, right? And no, I don't want to leave it out here in the middle of nowhere, let's see if we can get a tow truck out here. There's a farmhouse, let's go see if they have a telephone. Yikes! Those dogs look vicious - let's go to the next house, we can do with a nice walk. Hopefully the dogs there will be friendlier. Well, here we are, but they don't have a telephone. I'm going to borrow a bicycle. No, you can't stay here, go back and sit with the car, I don't want anyone stealing my hubcaps! Very funny - I don't suppose jackrabbits steal hubcaps! Sorry it took so long. I rode back into town and found the Gasoline Alley Service Station, but no one was there. I had to go look around, and found someone who knew how to drive the tow truck. Yeah, this gonna cost me some money - well, it'll cost my dad some money, I don't have any money. When it's running, it's my car, when it needs expensive repairs, it's my dad's car. Here we are at the station, on D Street and 2nd. 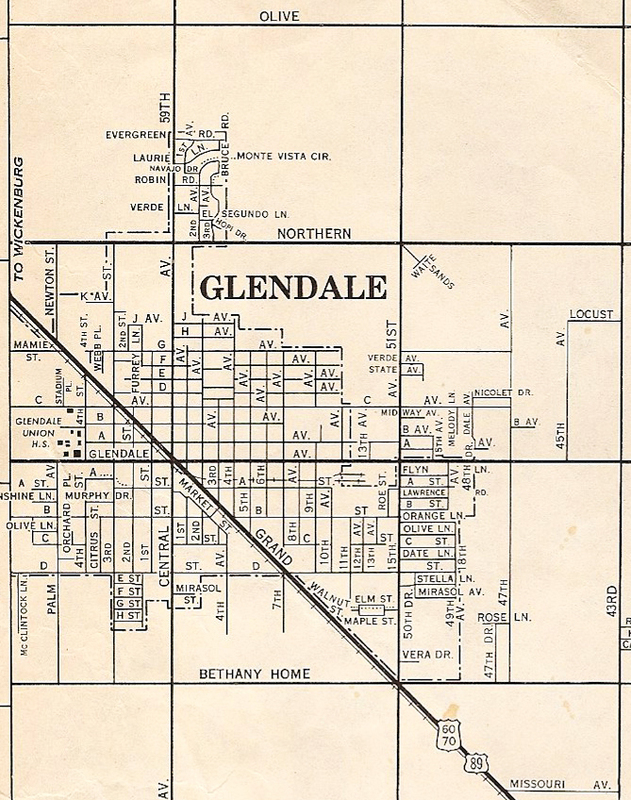 That's what I like about Glendale, everything is so easy to find there. I guess I'll leave the car here, they'll take care of it. Let's walk over to Main and 1st, see if we can find a place to buy a soda-pop! 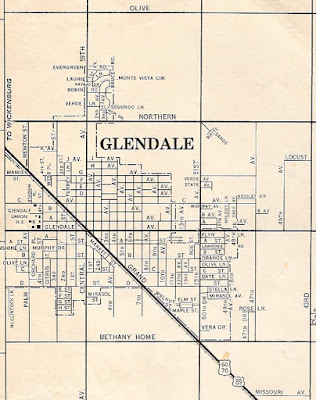 1957 map of Glendale, Arizona.